In a fairly large grid, group players into groups of three. You will only need one ball per group of 3 players. One player from each group will dribble around inside the grid while the other two players jog alongside the dribbler as to shadow him. On the coaches command the player dribbling the ball must pass the ball 10 to 15 yards into space. 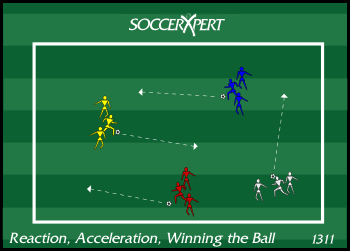 All three players attempt to win the ball quickly and cleanly. Upon winning possession the player that won the ball now becomes the dribbler and awaits the coach’s command to repeat the drill. You can make this drill into a competition and reward the player that wins the ball 5 times as the winner. The players should always remain ready and react quickly to the pass. Each player should battle for sole possession of the ball. One variation to this drill is to have the players juggle rather than dribble and volley the ball away on the coach’s command.